Cara Ramirez, Holcim Philippines Vice President for Communications, and Edmond Maceda, Co-chairman of the Department of Sustainability and Environmental Studies at Enderun Colleges, discuss the importance of sustainability during the Holcim’s forum to promote its student design competition. To instill the importance of sustainable construction among the next generation of builders and encourage participation in its design competition, cement maker Holcim Philippines, Inc. held a symposium on these topics at the David M. Consunji Theater in the Institute of Civil Engineering, UP Diliman on February 26. Close to 200 students from various engineering and architecture schools in Metro Manila participated in the symposium, where experts discussed the importance of sustainability and encouraged participation in the Young Builders Challenge (YBC), Holcim’s design competition that emphasizes the positive social and environmental impact of proposals. Edmond Maceda, Co-chairman of the Department of Sustainability and Environmental Studies at Enderun Colleges, provided an overview of the United Nation’s Sustainable Development Goals and discussed how aspiring construction industry professionals can contribute to its attainment. He called on the forum’s participants to make themselves more knowledgeable about sustainability issues and said their generation can make significant difference in this area. Carmelito Tatlonghari, a professional who evaluates the environmental impact of buildings using the standards of the US and Philippines Green Building Councils, talked about features that can be included in structures to make these eco-friendly. Edward Reyes, Head of Infrastucture at Holcim Philippines, shared pointers on properly managing project so proposals are realistic and feasible. Aaron Julius Lecciones, an assistant professor at the University of Philippines, Los Banos College of Human Ecology, shared his experience in being the Asia Pacific region winner in the first LafargeHolcim Awards for Sustainable Construction in 2005. The LafargeHolcim Foundation’s Sustainable Construction Awards, the leading global competition in this field. Since its launch in 2003, this competition has led to numerous ideas from building industry professionals worldwide to address some of society’s most pressing sustainability challenges. “Initiatives like YBC is important, especially in making students, who will be next generation of architects, designers, planners, and builders get engaged in sustainability at a very young age. It is also a way for them to express their ideas—what they think is sustainability for their generation and, to showcase their skills that they’ve already learned in the university. So, for students who have plans of joining this competition, I want them to go for it and enjoy the process,” said Lecciones. The 1st Young Builders’ Challenge is now accepting entries nationwide. It is open for submissions until 17 April 2019 to engineering and architecture students. Participants must be currently enrolled and in their third year in college. 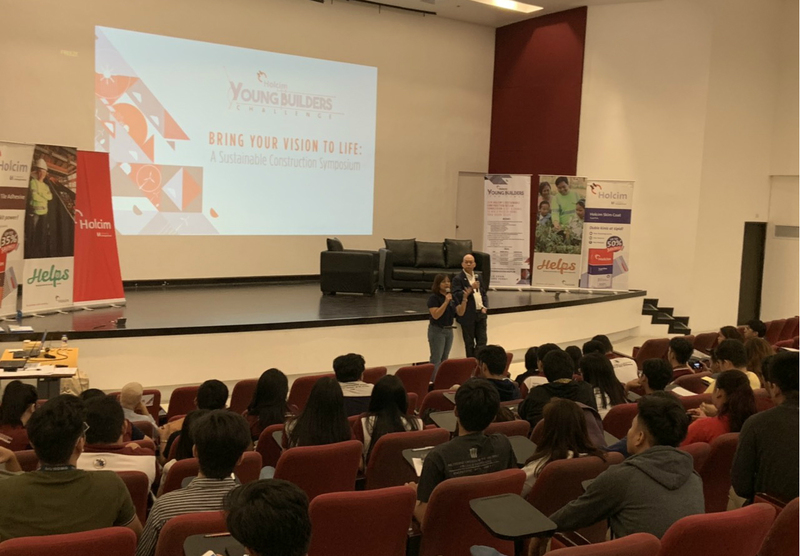 Cara Ramirez, Vice President for Communications at Holcim Philippines, said the YBC also allows local students to test their ideas before joining the global competition of the LafargeHolcim Foundation. “Sustainability is a relevant topic in these times, and the construction industry has a significant role to play. The YBC is part of Holcim Philippines’ efforts to influence the next generation of builders to adopt this mindset. We are also hoping that this encourages more local participation in LafargeHolcim Foundation Awards, where representatives from the Philippines were actually one of the first winners, to generate visionary ideas that benefit our country,” she said. Students who are interested in joining the competition may check the complete mechanics and guidelines at the YBC microsite at https://youngbuilderschallengeph.com.